Simulation games are a tricky business because there’s such a wide variety out there. Some want ultra realism in their title, some want it to have a bit more arcade flavor. So, developers have to give care and attention to balance the fun and exciting parts of jobs while allowing mechanics to circumvent the more tedious parts that some players don’t appreciate. Such as, were I to play OPN Writer simulator, I would only want to review really great games that I enjoy playing and have a passion for telling others about the game, or terrible games I can rip apart and the deadlines would be really soft. Reviewing mediocre games would be… well, mediocre. Similarly, when talking about truck simulators we want to experience the open road and see the sights; while a small set wants to follow all the rules, not many people want to pre-trip every trailer, adjust the brakes every day, fill out time logs, and comply with FMCSA hours-of-service rules. On The Road is an early access title that is released by Toxtronyx Interactive in an effort to find its place amongst the trucking simulator genre. The publisher Aerosoft, the self-proclaimed simulation company, has an impressive portfolio of titles, such as X-Plane 10 and the recently released Train Sim World: CSX Heavy Haul, but unfortunately, Toxtronyx Interactive only has one title under their belt — Bridge 2 — which has less-than-stellar user reviews in Steam. On The Road is likely a crucial title for the developer, but did it hit Early Access too soon in the development cycle? On The Road attempts to fill a hole in the Simulator genre by adding more detailed motorway interchanges and, at this point, fewer cities but with a wider range of details. 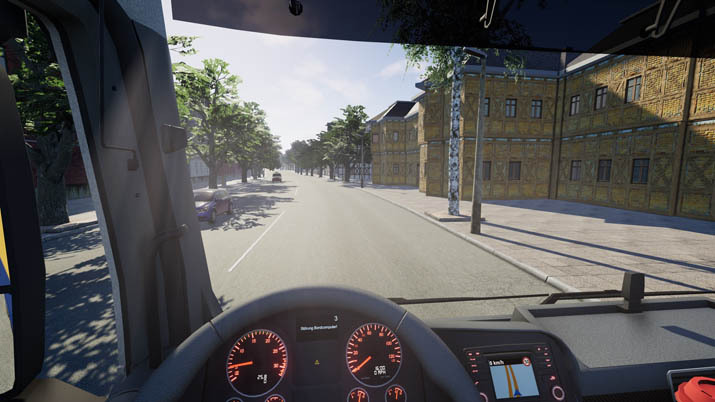 A standard issue with trucking simulators is the scale of the driving environment: an example of this would be 18 wheels-of-steel games would only have one or two main roads in each city, and just throw in a couple recognizable features. On The Road boasts some very nicely laid out cities; even with limited traffic, the cities feel alive and are well laid-out. The key features of cities, like the Horn Bridge in Kiel, bridge construction, and certain historical buildings are well-modeled, but not every building was given as much care, and it’s pretty evident. The cities are larger than I anticipated — and that’s pleasing — but it’s more similar to the feel of cities in Euro Truck Simulator than ETS2 DLC, which added an incredibly high level of detail. In its current state, On The Road just can’t compete. Visually, it’s in decent shape for an initial early release. There’s only one truck model available, and it’s very detailed with a high poly count, so it looks excellent, but as such it’s out of place with the visuals around it, which don’t come close, even on the highest settings. The details of the buildings look flat, and the two traffic cars models, based on the Opel Astra and Opel Vivaro, just don’t meet the standard of the primary and only truck model of the title. The shadows also have a weird feel of being too hard, or too fuzzy, which just compounds an already disjointed visual experience. You shouldn’t expect to pull a single trailer, much less an Australian style six trailer ‘powertrain,' since the only truck you have at the moment is a MAN straight truck with an integrated box. There is likely to be more coming down the road, especially if they support mods, but will these be additional paid DLC? When looking at the publisher's other releases, DLC is very telling; for example, X-Plane 10 has over a thousand dollars in DLC add-ons. However, American Truck Simulator hit steam with only two truck models at full release, but with mods, you had plenty in which to choose. Once you get your controller setup and start cruising around like a janky truck driver that’s spent too much time with the bottle before getting behind the wheel, you have to find a load to pick up and deliver and start your rolling empire of steel. However, you better remember precisely where you are, because it will not display on your logistics map. 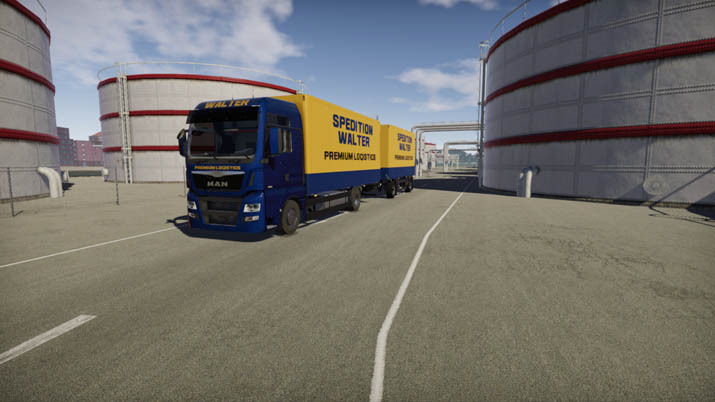 It’s also difficult to tell what cities and where the load pick-up location is, so unless you want to drive across Germany with one hand on your mouse and the other hand on your joystick, to get your first job you’ll have to do a bit of searching. When you arrive, there’s no loading dock to back up to or trailer to connect: just pull up to a space ringed by green arrows. Now, when you pull through the arrows, there's no indication that you’ve picked up the product. The feedback loop in simulation games typically goes: completing a relatively mundane task, mastering a particular skill and then receive compensation, such as backing in trailers, or cutting the heads off and harvesting fields in efficient rows. Since you just pull in and out without any more action, with only a bump in compensation upon delivery, it short circuits that loop and leads to a very unsatisfying experience. On The Road hits early access with a lot of potential but that’s really all it has right now. It’s barely a competent tech demo. While there doesn’t seem to be many glaring bugs, the control issues make them game frustrating at best and nearly outright unplayable. In its current state, it is highly disappointing for a simulation game. Nothing as of yet really stands out that is going to put this game ahead of a list of already great titles in the genre, and without significant changes, your money will likely be better spent elsewhere.